It’s not every day that you get to be besties with your favorite comedian, crack jokes backstage while sipping on champagne at one of history’s funniest nights and continue your bromance the next day while relaxing on the set of their movie. 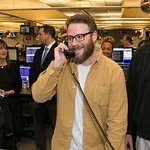 Omaze.com is now offering comedy fans everywhere the chance to fly to LA with a guest (hotel and airfare included) to enjoy a night with Seth Rogen and endless laughter at Hilarity for Charity. It doesn’t stop there. The experience continues on the set of Seth’s new movie, Townies. To enter, visit Omaze.com and make a $10 donation to Hilarity for Charity, where every dollar donated supports scholarship programs for families struggling with Alzheimer’s care. The contest closes on Friday, April 12th. Find out more here.